Durashine, the high-end solution dyed acrylic fibre from Thai Acrylic Fibre Co (TAF), lightened up the recently concluded Heimtextil in Frankfurt with 10 new shades, especially developed for premium end furniture market. The new colours were developed based on the upcoming design trends, demands from the fabric makers and insights from the key retailers. TAF, an Aditya Birla Group company, also showcased the products of their customers in their booth including fabrics from Bulliontex Co Ltd and colourful yarns from European Spinning Group. In addition to Durashine, there was a lot of interest for the anti-microbial fibre Amicor and the superior flame retardant fibre Pyrotex, according to a press release by the company. “Today a lot of customisation is being demanded by our customers from furniture segment as the designs and trends are changing very fast. 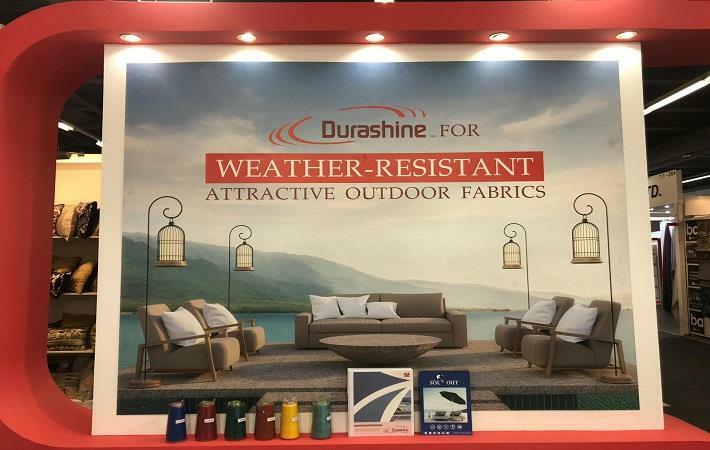 With Durashine now having more than 20 colours, we are able to develop a very large range of fabric designs for our customers to choose from. It has also given us the flexibility to blend different colours together in the yarn to get wonderful effects,” said Thaveechai Sirikulthada (Dev), director of Bulliontex – manufacturers of fabrics for upholstery and technical fabrics. “We got wonderful response from the industry in Heimtextil and our customers across the value chain appreciated the new shades that we have developed. We also gathered ideas on the new innovations and shades that we can develop in the future to help our customers differentiate their offering,” said Satyaki Ghosh, CEO, TAF.